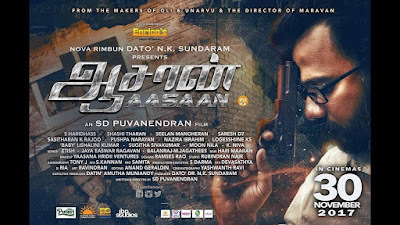 Following Maaravaan, the hype on SD Puvanendran has been immense. After delivering a quality film, people where anxious to know what is next on the cards from him. The hype increased further when he announced that he would be joining hands once again with Haridhass for a film titled “Aasaan”. 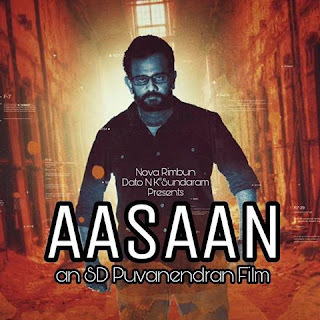 I was blessed to be provided with an opportunity to watch Aasaan on it's premier screening at Federal Theater on the 15th November 2017 and here is my review of the film. 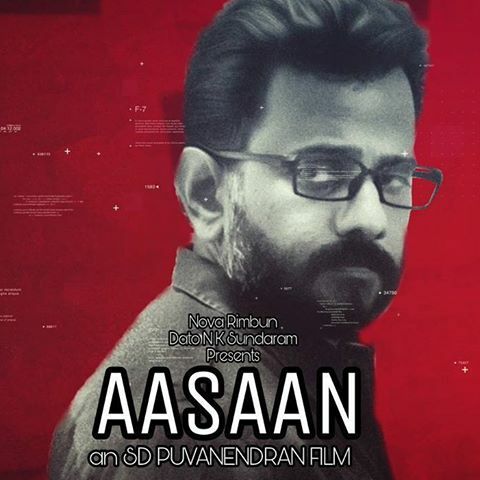 Aasaan is film that can be easily divided into two halves. The 1st half of the films taps into one type of genre while the second half of the film taps into a different genre. From the trailer, we can see that this film revolves around an Applied Mathematics Professor life. The first half of the films explores the relationship between Madhoosudanan (played by Haridhass), an Applied Mathematics Professor and his daughter Mythili and the struggles they go through together. This portion of the film is written in a way that keeps us wondering why they are going through these struggles and how can they come out of it. The reasons why and how are kept hold tightly by the director until the interval block before it is revealed and that leads us to the second half of the film. Here is where the story moves on how Madhoosudanan overcomes this phase of difficulty. The second half of the film deals about how Madhoosudanan engages his mathematical knowledge to solve an issue and at the same time use that to solve his own difficulties. The biggest credit I can give for the story is about how smartly the film was written. 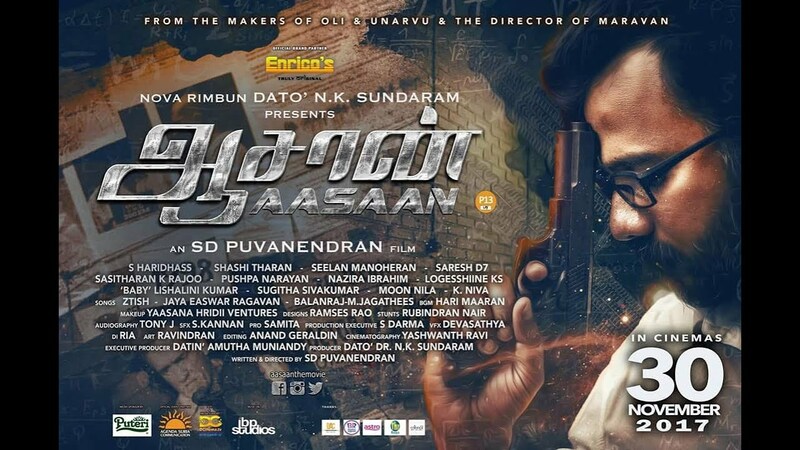 As I understand it took SD Puvanendran a year to write the script. So much of research has been done into developing the script. I am sure if you were to go and google the terms they used in the film, it would be a real term and justified why it was used in the film. Well done to the whole directing team for doing your homework well. It was great to see our films moving into new zones and in this film the whole mathematical portion was such a welcomed addition. I enjoyed how well that was written into the script and it was the script that demanded such thing not an element being forced in. Well done on this. However, what I didn’t enjoy in the film story wise was the lack of pace throughout the film. I felt too many things were put in the film to shows us the development of the character or story and that kind of slowed the pace of the film. The slow pace worked well for the first of half of the film as it deals between the relationship between a father and his daughter despite it could have been trimmed down much more and use that screen time in the second half. Since the second half of the film deals with Madhoosudanan working out his problems, I was expecting more pace and engagement in it. In simple words, I felt it should have had more “mass” feel in it which it was lacking badly. The designs of a couple of scenes could have been treated much differently and better to create this "mass" feel which could have hyped up the audience better. An example would be the video clue decoding scene. Despite having a good smart film, certain lags in the film pushes me to give the story review a slightly low scoring than what it could have been if it was treated differently. The way this film was treated and directed, it doesn’t look to be in the hands of a man who has only directed 2 films. SD Puvanendran is without a doubt one of the neatest film director in the Malaysian Tamil Film Industry now. I loved the effort and work he put into developing this script. I am very confident you had done a lot of research and study to incorporate the mathematical genre into this film. After Aasaan I am confident more directors would start venturing into new scopes for their films. Thank you for that. Credit to you on the way you designed the Madhoosudanan character. The character had a few different shades into him and you designed it very well and places those different shades at the right time and place. Well done. I enjoyed your placings of “Paathi Nilavu” in the film as it gave life to those portions which brings us to the manner you wrote the father-daughter dynamics. Having a daughter, yourself, I am sure it must have been an amazing experience writing and shooting this portion. It came out beautifully and I am sure there are portions in the film which will make the audience cry. I loved the way the scenes which shows the mini flashbacks/montage/memories of the character was done. The pace of it and the colouring of it was very well done and I enjoyed that idea of executing it. What lacks in terms of story was well made up for in terms of directions and other technical aspects. There is a reason why people talk highly about you as a director and Aasaan will further establish your name as one of the finest director in our country. The first thing I felt about you after watching Aasaan was “WOW!”. You were a class of your own in this film. It is so easy to see why you are perhaps the finest actor in our industry. Such a powerful performance by you. Wow! This is a film that gives the lead character plenty of screen time and power to dictate the film. It is a character that has various shades to him. Let it be happy, sad, frustrated, angry and even looking crazy. 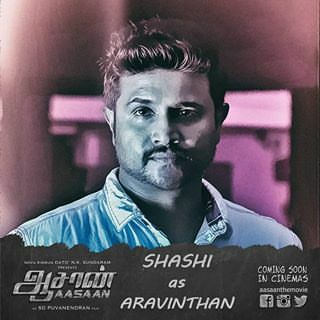 Out of all the actors available, I must thank SD Puvanendran for picking you to this role and huge credit to you for taking up this role. From the character design, it is obvious that this is such a challenging role to execute and you played it brilliantly. I came in as an audience and walked out as a fan of Haridhass. There is so many scenes I can pick out to highlight your capabilities as an actor. One example would be the interval block scene. So much of raw expression you showed. I was stunned. My personal favourite scene int the film was the way you emote while Mythili speaks to her mother over the phone. It captures the very emotion of being a father. I am sure this is a scene that will drive tears out of the audience. 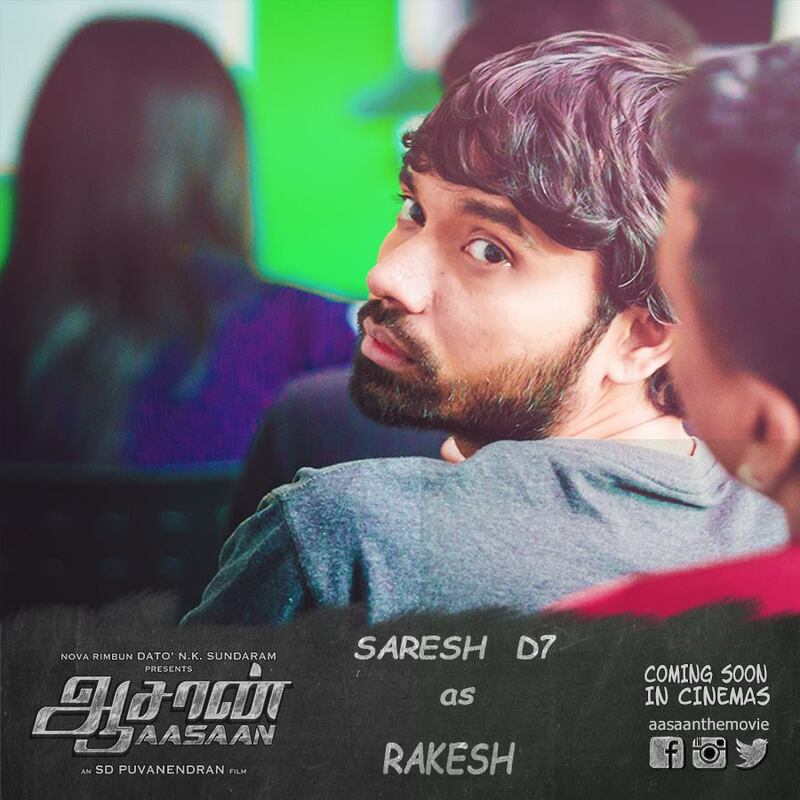 Both Shashi & Seelan plays a bit part role in the film yet an important character that is needed for the story. I particularly enjoyed Shashi performance, who plays the managing director of a big organization. His screen chemistry with Haridhass should be lauded. To share the screen with such a powerful actor like Haridhass, Shashi had to ensure that his performance was equally good to compliment what Haridhass was giving and he rightly did so. Despite the limited scope given to him, he can bring out a good performance and it is something the audience will enjoy. 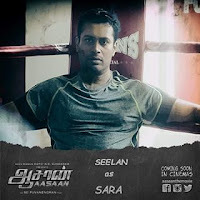 Seelan in the other hand plays the role of the lead character’s most trustable aide and best friend. Once again, his character also has a very limited scope and room to stand out and perform. He executes the given role without much trouble. His scene where he speaks to a “Datuk” is one that will evoke laughter with the crowd and you should good humor body language in that scene which should be complimented. Saresh plays the role of Rakesh in this film whereby he is a student is Madhoosudanan’s class and is also a hacker who does it on a small scale. He is one of the character that brings laughter to screen in what is more of a serious toned film. He will convince you with his performance as hacker not because of the computer knowledge his character has but with the way he executes the role. From changing his looks to the way, he talks and thinks, Saresh D-& has clearly did his home on how a hacker student will sit, talk or behave. Well done. 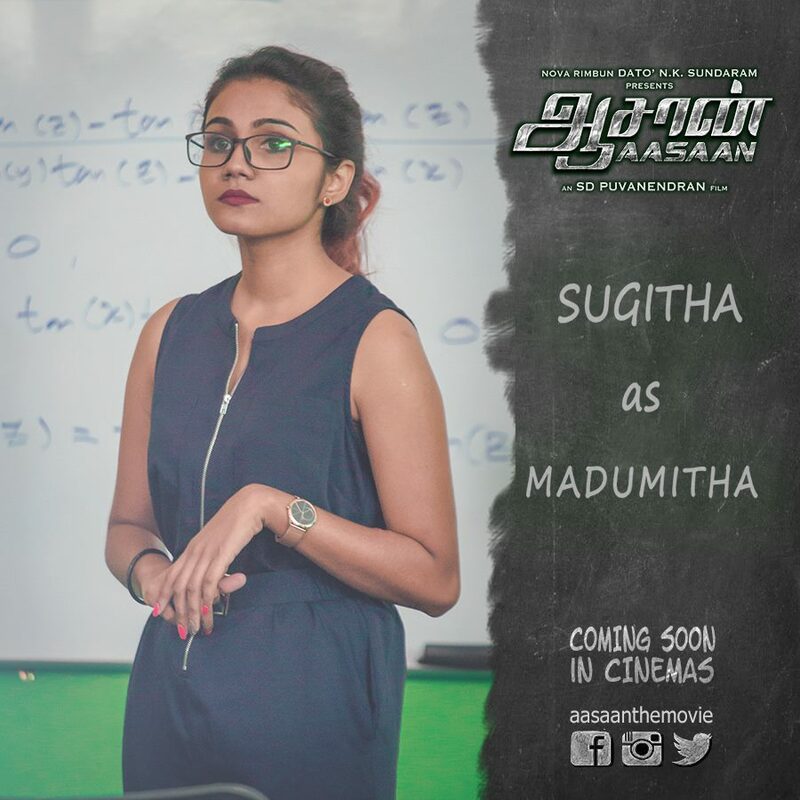 Sugitha pivotal role in bringing the film to the second half of the film. 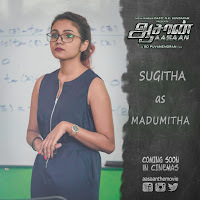 Once again it is a character with very little scope to perform except a couple of classroom scenes and how she reacts to Saresh’s advances is commendable. 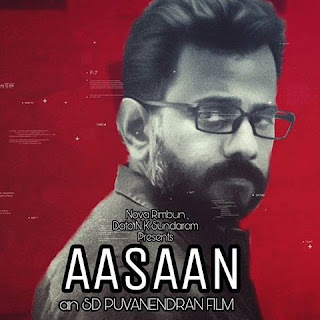 When the audio launch of Aasaan was done, it was making rounds as this film has 3 different music directors for 3 songs and another musician for the background score as per the following. This seemed different and once again a welcome addition to see multiple music directors working in one film. As amazing as all 3 songs turned out to be, what was the biggest let down for me was the length of the song used in the film. The film didn’t used the full track of the song and for me that was a real let down. 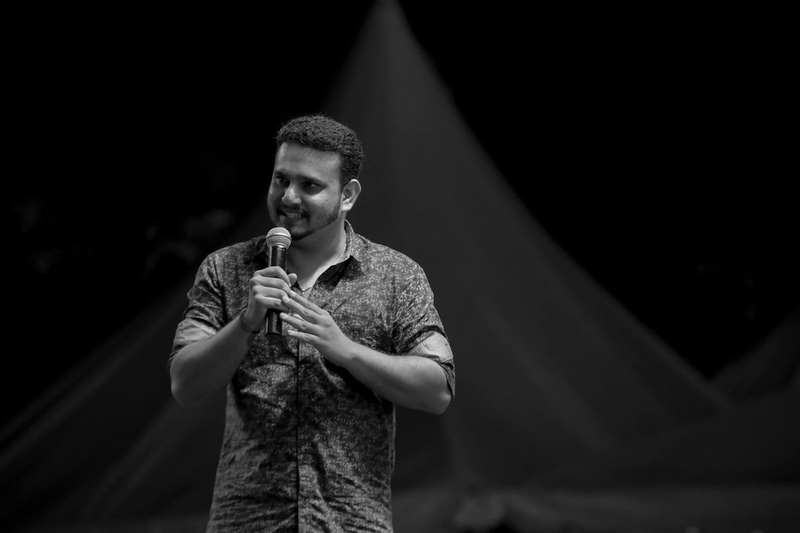 Among the 3 songs, the one song that was well utilized in the film was “Paathi Nilavu”. This is another slow poison magic by Ztish and it grows on to you over time. It gets better when you see the placing of the song in the film with the visuals. It surely did make a few people cry in the premier. Without a doubt Ztish has now if not establish himself as one of the best music composer in our country. Looks like every song he touches turns out to be a masterpiece. A big area of improvement in this film for me was the background score. In many portions, the background score didn’t compliment the scene that was going and was a turn off, especially in the climax scene. I am going to rate the music portion of the film as 3 full tracks and bgm instead of the length of the track that was used in the film.